The Illinois Longitudinal Data System (ILDS) is Illinois’s public education state longitudinal data system (SLDS) governed by the LDS Governing Board, an intergovernmental committee comprised of the members from each of the state agencies that contribute to the ILDS and an appointee from the Office of the Governor. The ILDS, created for the purpose of collecting and analyzing Illinois public education data at the individual, course, institution, and system levels, aggregates data records from the breadth of the Illinois public education systems. The combined data collection systems are part a nation-wide effort to record granular public education detail over time in order to document the entirety of students’ education experience. This information is intended to be available for analysis and public policy consideration for the purpose of producing improvements in student learning at elementary, secondary, post-secondary, and higher education levels, and to optimize labor market outcomes, individually and generally. Illinois is one of the 47 states having received public funding to create a state longitudinal data system (SLDS). Despite state-to-state differences, each SLDS shares a common purpose of supporting research and analysis with the intent of informing individual, household, and public policy decisions based on standardized criteria. This review assesses the overall quality of the ILDS as an SLDS by considering the nature of the organization maintaining the data system, those agencies and institutions providing inputs to the data system, and to which agencies and institutions the data systems’ outputs are available. The assessment also considers the data system’s funding mechanisms, internal and external researcher data accessibility, the quality of the data system’s public user interface (dashboard), and the data system’s current Data Quality Campaign (DQC) ranking. This report considers each of these criteria pertaining to ILES and provides contact information to the departments and individuals who maintain and manage the SLDS. The ILDS Governing Board works to establish an internal set of tools, systems and processes for the ILDS that can be shared across state agencies to ensure data interoperability between each agencies’ data system. The ultimate goal of the board is to support the analysis and understanding of lifelong education and workforce policies and programs within the state of Illinois and allow the state education and workforce policy makers to utilize research based decision making practices. The board addresses issues that are shared by each of the participating state agencies, such as how data will be accessed by internal and external agents, how data records will be secured and how to ensure that the participating state agencies share data in accordance with established procedures and rules. The board is mandated to address these issues in ways that ensure robust protections for individual privacy and compliance with all pertinent state and federal laws. The board also works with external advisors working within the education and workforce fields to make certain that the ILDS is inclusive to outside perspectives and audiences. An important role of the board is to annually establish a plan for major ILDS-related activities for the upcoming 18 months. This plan guides the agencies in determining ILDS priorities and projects. Northern Illinois University (NIU) was officially designated to be the CDDA for the ILDS. NIU was chosen through a competitive RFP process because of its ability to provide supporting services to the ILDS in addition to the previously mentioned services. NIU developed a CDDA dashboard with a user-friendly interface which enables authorized LDS agency staff members to easily monitor and manage CDD data activities. NIU also provides demographic data standardization guidance and technical support to the LDS agencies. It establishes common data structures and data definitions that LDS agencies should adhere to and follow within their data systems to reduce potential data errors and inconsistencies between different system’s data records. In addition, ILDS has utilized funding from Illinois’ Race to the Top – Early Learning Challenge award and the Workforce Data Quality Initiative to support the ILDS. The ILDS Governing Board has created a common data sharing agreement template that can be used for projects involving multiple ILDS agencies and a third-party organization. In addition, the ILDS agencies have begun the process of aligning their data request form questionnaires into a common form. These agencies are expected to finalize and publicize a common interagency data request form questionnaire in early 2017. These developments will significantly decrease the difficulties and inefficiencies of the data sharing process with third-party organizations. Access to specific ILDS agency’s data will still require consent from that ILDS agency’s separate processes and protocols but these processes and protocols should differ little from the common data sharing agreement template. The ILDS has its own website, www.illinoislds.org, and also uses other public portals to disseminate information such as the Illinois Early Childhood Asset Map and the Illinois Report Card. The Illinois Report Card portal, is operated for the purpose of providing useful aggregate level data about various education issues to interested parties within the state of Illinois. These parties include administrators, educators, policy makers, parents, students and other parties interested in education outcomes within the state of Illinois. The quality of these portals will be evaluated using several different criteria which include: the user-friendliness of the portal, the extent of data offered by the portal, whether the portal is self-sufficient or relies upon other webpages to provide information, and the extent of customizable reports that can be created using the portal. Illinois Report Card portal is straight forward to use, the home page of the portal explains the purpose of the portal and provides a brief overview of the reports it contains. The home page also contains a portal overview video, which further explains how the reports can aid parties interested in the state of Illinois’s public education. If portal users need further help understanding or accessing reports within the portal, the portal has a Help tab located in the home bar at the top of the home page. The Help tab links to an informative page that thoroughly explains the purpose of the portal and how to properly view reports located within the portal. The Illinois Report Card portal offers K-12 data reports on each district located within the K-12 public education system. These reports contain a significant amount of aggregate level information about each district within the following education categories: Snapshot Analysis, Academic Progress, District Environment, Students, Educators, and Schools in District. Each of these categories contain multiple sub-categories that provide information on specific factors pertinent to the main category. The portal also provides a comprehensive overview of the entire state of Illinois and its performance in these various categories. The Illinois Report Card portal allows interested parties to customize the reports available through the portal by district specification. In addition, interested parties can further customize the sub-categories located within the district reports to view specific variables. These specific variables span across a wide variety of subjects, including state and district comparisons, student demographics, trend rates and more. Once interested parties have designated which reports and variables they would like to view, the report is automatically generated on-site. In 2016, Illinois has reported to have met State Action 1 and is in the process of meeting State Actions 5,6,9, and 10. This schematic is offered to provide a simplified, visual presentation of the ILDS and the channels through which data flows into and out of the SLDS. 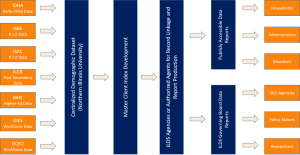 The entities on the far left side of the schematic represent the data record providers to the ILDS. The entities in the middle of the schematic represent the ILDS data warehouse and public user portal. The entities on the far right side of the schematic represent the parties intended to receive benefits from the outputs generated by the ILDS.